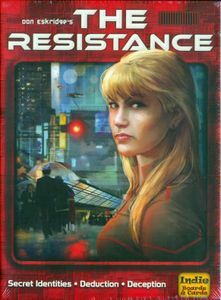 Buy The Resistance and PriceWatch, Buy this board game at the Lowest Price. The Resistance and its sister game, The Resistance: Avalon, are amazing social deduction games by Indie Boards and Cards. Part of what makes these games so good is that there is so little to them. In the inexpensive little box you'll find some cards, a few chits, a few small tableaus, and a rule sheet. You see most of The Resistance takes place above the table between you and your friends.You will lie to your friends. And they will lie back to you. Sometimes one of you will make a lie so perfect, so intricately woven that when it's at long last revealed, everyone will stare at the liar completely dumbfounded. Other times a lie will fail so miserably that you'll all laugh at the poor exposed villain. In The Resistance you'll be dealt a secret identity at the start of the game. You'll either be a loyal member of the resistance or a spy that's infiltrated the group.The spies have the luxury of knowing who the other spies are.The loyal members, meanwhile, will have to use their wits to figure out who they can trust and who they can't. The game will take place over five missions.The good guys win if three missions are successful, while the spies win if three missions fail. Most of the game comes down to deciding who you send on a mission, because if even a single spy gets placed on a mission he just has to play a fail card and the mission is failed. And that's basically all there is to it. The Resistance is social deduction boiled down to its core elements. It's you sitting across the table from your friends and deciding which ones you absolutely can trust and absolutely cannot. Sometimes though, you'll be the one that can't be trusted. You'll be the spy lying to your friends. And sometimes you'll get away with it. And when you do it will feel so good. It's the final mission. Thankfully I was able to convince the others that I was innocent of earlier accusations and I'm on the mission. My accuser, now discredited was not invited. My friend across the table, who now trusts me again, is shuffling the results of the mission. Just four little cards. If even one of them says fail, well, it's all over for the resistance.